But with all the worry and work to make sure their loved ones get what they need, caregivers may be neglecting their own nutrition. Michelle Kerr, chief clinical officer for Visiting Nurse Association of Ohio, said caregivers of the elderly and ailing must pay attention to their own health and wellbeing. That means getting enough rest and eating right. Unfortunately, Kerr said, those are lofty goals for a person whose days and nights are spent tending to the most basic needs of someone else. So caregivers often turn to cheap, quick dining options that tend to be high in fat and sodium and low in essential nutrients. 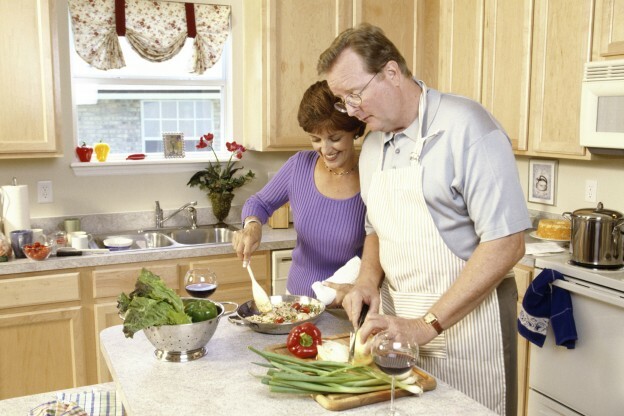 A report produced by the Wellbeing Program of Washington State University offers suggestions for even the most time-strapped, budget-conscious caregivers to maintain a healthful diet. Drink plenty of water. Staying hydrated is one of the most important components of good health. Drinking water helps joints work better and transports nutrients throughout the body. Fill a bottle, carry it with you and sip throughout the day. You’ll be surprised how fast you get through the recommended two-to-three quarts (eight glasses) per day. Avoid processed foods. Choose whole grains, fruits and vegetables and foods that are prepared fresh. Plan ahead. Cook one-pot meals in large batches and freeze for later. Slow cookers work well for this purpose. Even those meals prepared on the fly can be made to include enough for quickly reheated leftovers the following day. Go shopping with a list that includes healthy, easy-to-prepare snack foods. Fresh fruits and vegetables are best for you when eaten raw. It doesn’t get easier to prepare than that! Other options include peanut butter sandwiches, cheese and crackers and yogurt. Avoid convenience foods that contain fat and preservatives and cost more per serving. Be sure to stock your pantry and freezer with items that can be prepared in just a few minutes for those frantic days – think whole-grain pasta and brown rice paired with your favorite made-ahead sauce, veggies, beans or tofu. There’s no excuse to go through the drive-thru if you know you have something quick and easy to prepare at home. Learn more about VNA of Ohio home health and hospice care, or call us today at 1-877-698-6264.